How did Kerintha film happen? I have prepared a story with same characters and a death sentiment. I was going to produce the movie as well. That’s when Dil Raju has asked me to narrated it. He liked it and wanted to produce the movie. We prepared a bound script. Dil Raju has suggested that we should have a pleasant story instead of a death sentiment film. It took us almost 2 years to iron the script. We also held a star hunt. We held workshops for all the actors with bound script and started the shoot. After 30 days of shoot, we saw the rushes and Dil Raju felt that something is missing. He wanted more idealistic/inspiring attributes to Jai character so that it can inspire the other friends in their gang. He has asked us to not to worry about 30 days of shoot. He wanted us to think afresh. It took around 3 months to modify the script. Then we scrapped the 30 days of shoot and shot the entire film again in 64 working days. 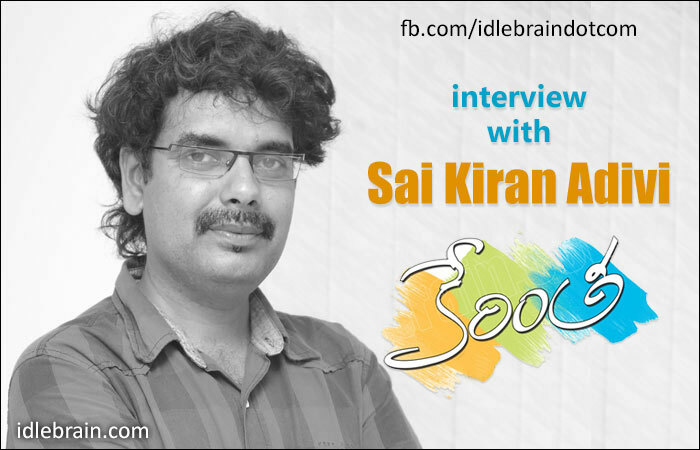 While developing Jai character I have used the attributes of Dil Raju. He is a positive guy and he inspires others with his positive thinking. That’s the secret of his success besides a great judgment. I learned to be positive after started working with him. Whats the reason for taking only 3 new faces among the six main leads? I wanted to have fresh cast. But Dil Raju suggested that we could go with Sai Dharam Tej, Sundeep Kishan and Adith as male leads. But, we have finally decided to go with fresh cast. We have really tried to cast all new faces. But we realised that we need a known face for Jai as it’s a mature character that instills confidence in others and guides them. That’s why we have taken Sumanth Ashwin after due consideration. Viswant is from USA. He saw casting call in idlebrain.com and applied for star hunt. We have asked him for a video and he sent us a relevant one and we immediately decided to cast him. Parvateesam came to our office impressed us with an audition. Then he got selected through MAA TV. Sukruthi studies engineering in Delhi. She sent us the pictures and video. She also had theater background which is the reason why she acted like a professional in the movie. One thing we are proud about Kerintha is that it is made with all Telugu actors which is rare in Telugu films. Having three heroines and casting Telugu girls for those characters is an achievement in current scenario. What do you think are plus points of the film? The characterizations. There is genuinity in the characters and there is no pretension in the writing. Since there are six different characters in the movie, everybody will identify with at least two among their friends. Nookaraju character is providing entertainment in theaters. How did you come up with that? Nookaraju character is something I have written n 2002. My sister Sridevi was working as lecturer in a college in Vizag and she encountered a student who just speaks and behaves like Nookaraju. She has narrated me that incident. I and my friend Kavi have written the character of Nookaraju. The scooter I used for Nookaraju character is mine. I didn’t sell that scooter when I bought other vehicles as I wanted to use that old scooter for Nookaraju. Tell us about team of Kerintha? It’s Dil Raju because of whom I got the best technical team. Abburi Ravi and Hari contributed a lot in the script. Micky J Meyer has given terrific songs and background music. My personal best is Ye Katha penned beautifully by Rama Jogaiah Sastri. Cinematographer Vijay K Chakravarthi has got all his experience and taste in cinematography. It was art director Rama Krishna who got us permission to shoot in NIRD campus. I would like to thank all the people who stuck with me during three years of journey in direction department. Tell us about your future projects? I had quite a few offers when I was directing Kerintha. But I didn’t okayed any because I wanted to finish Kerintha first. Allari Naresh has sent me a producer for whom I said no citing Kerintha as reason. I was offered Anamika film (Telugu version of Kahani), but refused as I knew it shouldn’t be remade in Telugu. I know my strengths and weaknesses and I try to stick to my strength while doing scripts. I will officially announce my new project after a week.